A cup of 16-bean soup packs a hefty nutritional punch. Full of fiber, high in protein, but low in fat, this soup provides a variety of health benefits. Simple 16-bean soup containing nothing but beans, peas and legumes has the potential to become a gourmet food with additions such as onions, tomatoes, rice and spices. These simple additions not only enhance the flavor, but increase the overall health benefits as well. As the name implies, 16-bean soup contains 16 different kinds of beans. 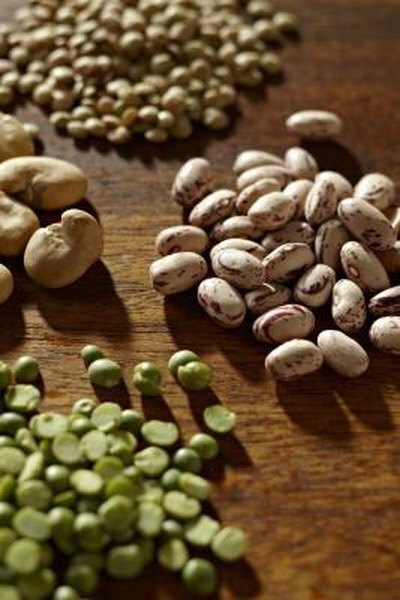 These beans typically include pinto beans, small red beans, small white beans, great northern beans, large lima beans, baby lima beans, yellow split peas, green split peas, lentils, large kidney beans, small kidney beans, blackeye peas, black turtle beans, garbanzo beans, pearl barley, whole green peas and pink beans. Soaking these beans in water, boiling and then simmering them over a low flame for several hours creates a hearty 16-bean soup. Most 16-bean soups contain additional ingredients such as onions, tomatoes, garlic, salt, pepper or other flavors and seasonings. One cup of the plain soup, without any additional ingredients, contains 225 calories per 1-cup serving. Plain 16-bean soup contains very little fat, only about 1 gram per cup. Of the 225 calories per cup, only 9 of those calories come from fat, none of which is saturated. Saturated fat increases your risk of heat attack and stroke by increasing your levels of LDL or "bad" cholesterol. Most of the fats in 16-bean soup are of the monounsatured or polyunsaturated type. These fats, when used in place of saturated and trans fats can lower your cholesterol levels. Beans contain a rich source of both soluble and insoluble fiber. Insoluble fiber helps prevent or relieve constipation, colon cancer and other gastrointestinal issues, while soluble fiber helps lowers LDL cholesterol levels, without affecting the levels of HDL or "good" cholesterol. The amount of fiber in the various bean varieties vary, but not significantly. Soups made of 16 different types of beans, peas and legumes have the advantage of containing different fiber types and amounts. The amount of fiber in various 16-bean soups range from about 4 grams to 16 grams of fiber per 1-cup serving, or about 20 to 50 percent of your daily recommended intake. Beans contain phytochemicals, including lignans, flavonoids and phytosterols. Each of these chemicals helps prevent a variety of health issues. Lignans play a role in preventing osteoporosis, heart disease and some cancers. Flavonoids, also reduce the risk of developing heart disease and certain cancers and phytosterols work to reduce total blood cholesterol levels. While not listed specifically on the label of 16-bean soup, these phytochemicals contribute to the overall nutrition of 16-bean soup, regardless of other ingredients that may also be included. Beans contain notable levels of protein. The building blocks of protein consist of amino acids. You need to actually eat 9 specific amino acids, known as the essential amino acids, because your body cannot make them. Complete proteins, such as those found in meat, fish, poultry, eggs, soybeans, milk, yogurt and cheese contain these 9 essential amino acids. Incomplete proteins lack one or more of the essential amino acids. Sources of incomplete protein include the beans and peas found in 16-bean soup. When combined with rice or other grains, 16-bean soup becomes a complete protein source. One cup of 16-bean soup contains about 15g to 30g of protein, roughly half the recommended daily intake for healthy adults.